Keeping your flowers fresh forever is just impossible. As much as you want to have your wedding bouquet, Valentines’ arrangement or any other flowers bouquet alive, they will wither eventually. 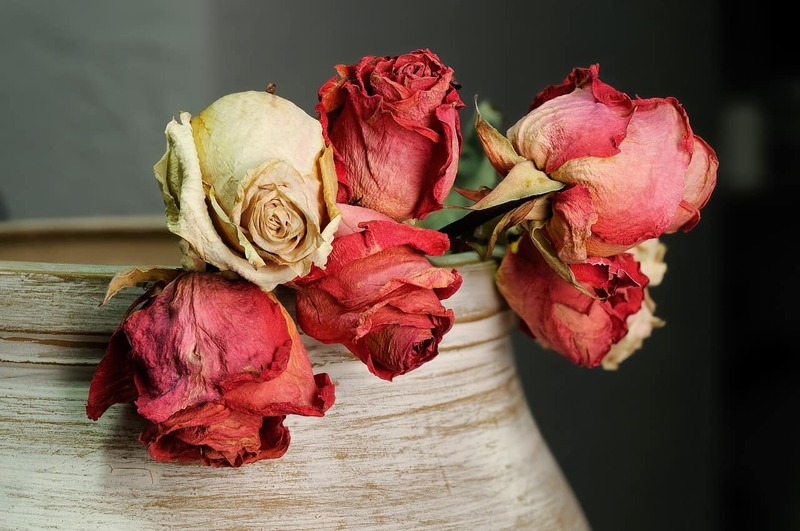 Unless looking at these how to dry flowers methods, you may need to immediately dispose of your fresh flowers once they start shriveling. There are ways of preserving flowers you can try at home. Using the air-drying method, book pressing method, applying silica gel or microwave pressing method will allow fresh flowers to draw their moisture out. Hence, creating dried flowers that could last for years. Got interested already? Here’s how they’re done. Preserving flowers using air-drying method is fairly easy. All you need to do is hanging your flowers upside down. Gather the flowers and tie them with a rubber band. Hang them in a well-ventilated area and avoid exposing them in direct sun will help the drying process to happen. As you hang your flowers, you may notice your fresh flowers start to shrink. Their fresh color will fade and create such a vintage hues kind of flowers. Some petals might fall off and some mold infestation might attack along the way. React accordingly and do what you need to do if you find these happen during the drying process. Allow this process to last for two to four weeks. Once you feel like they are completely dried out, take them off from the hanger and give a quick spritz to prevent petals from crumbling. Before there were professionals flower preservation services, book pressing method was already there. This super easy preservation method is especially for those who don’t mind about precision. Indeed, you may have to compromise the final result with little effort and upkeep you do during the drying process. This method is especially suitable for individual cut flower. Preserving flowers bouquet using this method should be precedent by loosening up the bouquet into individual flower. Giving you an easy example, here’s how to dry roses using book pressing method. First, you need to prepare some fresh roses, a heavy hardcover book, sheets of paper or paper wax, and a pair of scissors or a cutter. Start by setting up the roses. Remove as much as the stem where the most moisture is stored. Keep petals that strongly intact and remove the ones that seem to fall off immediately. Take your book and go to the center page. Have the pages covered by a sheet of paper of waxed paper. Close and reopen the page to allow creasing. Place your prepared rose and press it flat on the book. The paper linings on the pages are meant to absorb the roses’ moisture. Hence, replacing the paper once a week will provide a dryer surface for further absorbs. After 4 to 5 weeks of pressing and replacing the paper, you should get beautiful dry roses that last forever. If you have a bunch of flowers to preserve with limited time available, you may consider preserving flowers using silica gel. Instead of hanging your flowers uncovered like in the traditional air-drying method, you cover the entire flowers using silica gel. Silica gel will act as a moisture-absorbing desiccant. It is made of silicon dioxide, an essential component of sand. Without any further ado, here’s how to dry flowers using silica gels. First, add some silica gel to a flat-bottomed, airtight container. This bottom layer of silica gel should measure between half an inch to an inch thick. Place a layer of flowers and add more gel directly onto the flowers. Make sure that the gel fully covers the blooms and reach all nooks and crannies. Pop the lid and let the gel do the magic. Within a few days up to a week, depending on how many flowers, you should get your flowers fully dried. Take the dried flowers out of the container and brush off the excess gel. If the remaining gel hasn’t turned into pinkish color, you can save them for later uses. However, if it turns pink, it means the gel already used all its absorbing abilities and cannot be used for later. If you feel like have no patience doing the previous three methods, you can try microwave pressing to preserve your flowers. Besides a microwave, you need to prepare two microwave-safe ceramic plates, coffee filters and any flowers of your choice. Begin the preserving flowers process by sandwich-ing a ceramic plate (face up), a sheet of a coffee filter, a flower, another sheet of a coffee filter, and a ceramic plate. Throw this sandwich into the microwave and set for a minute. The heat should turn the flower moisture into vapor gradually. Check the flowers, and replace the coffee filters with the new ones. Repeat the process several times and stop when the flowers are fully dried. Another method for preserving flowers is leaving the flower in a vase. This is definitely the most effortless way to dry your flowers. The method can be quite experimental, as some flowers cannot follow this preserving method. Flowers with sturdy stalks such as hydrangea or baby’s breath can likely pull out the method. Flowers with more tender stalks like roses, daisies, lily, etc. will retain the moisture in their stems and promote rotting. Preserving flowers this lazy, can be done by placing some stalks of flowers in a vase. When the flowers are still fresh, try to fill the vase with a few inches of water. Wait until the water is fully evaporated. When this happens, the drying process should begin soon. Wait for few weeks until the flowers are completely dried. Now that your fresh flowers successfully preserved into dried flowers, you can keep them for years and rejoice your sweet memories. You can also use them to add texture to your room. You can put them in a vase and get a beautiful table decoration or simply hang them on the wall. If you get your wedding bouquet or other arrangement preserved, you can save them in a glass container with an elegant finish.